Institute of Banking Personnel Selection (IBPS) is an autonomous agency in India that started functioning as a recruitment agency for banking manpower requirements in the year 1975. It recruits candidates for the various public sector banks that fall under its ambit. In order to select apt candidates for various posts and departments in the public sector banks, IBPS conducts written examination and personal interview. In order to get placed in any of the 29 public sector and regional rural banks in India the candidates now have to mandatorily undergo these common written tests. They should begin preparation for the written examination right after they have applied for a particular post. The IBPS conducts the written examination through various examination centres in varied locations across the country via online mode. The body conducts recruitment for Specialist Officers, Probationary Officers, Clerical Cadre and manpower in regional rural banks. 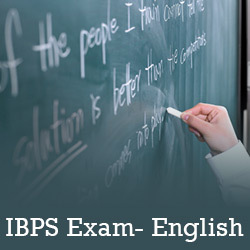 Different recruitment examinations conducted by the IBPS contains different syllabus and subjects. But one of the common paper among all the posts is English Language (Except for Rajbhasha Adhikari post), offered through IBPS. Hence, it is very important to have a clear knowledge of the language and develop a basic idea of the same to score well in the examination. • Helps scoring more in the overall examination: English Language is such a paper which can make or break your chances of clearing the written examination for any competitive examination. If you have a proper training in this language and have all the basics clear, you can end up scoring the cut off marks quite easily in the subject. The language can also increase your overall cut off mark in the examination and place you in higher ranks. • Time saving subject: English Language paper is one of the time saving paper among all the other papers in any recruitment examination conducted by IBPS. These questions are purely based on grammatical logic and test the overall knowledge of the candidates in the language. The candidates can use the saved time from this paper to solve more critical papers like quantitative aptitude and logical reasoning, which takes more time to solve. • Helps to boost your confidence in the interview round: English language is something which you really can’t avoid as you have to face the interview panel and answer their questions in the language. Though there remains no pressure to the candidates to take the interview round in English from the authorities, it is better to create a lasting impression through uttering perfect words with subtle tone in English language in front of the interview panel. Coining wonderfully articulated words in the language often helps boosting the confidence in the candidates during the interview. • Inclusion of the subject in both prelims and Mains examination: The IBPS has introduced two round written examination for nearly all the posts in offer, due to the huge rise in the number of candidates applying for the banking posts every year. It has included English language paper in both the tiers of the examination, which clearly shows the emphasis given to the language. The selection committee wants to select candidates who have clear knowledge of the language and can handle official work in future, which is mostly carried out in the English language.